Mirrors are commonly used as decorative accents, and an engraved glass accent mirror takes decorating with mirrors to the next level. Engraved glass is glass that has been treated or worked on with special tools to create textures, pictures, words or abstract images. There are different tools and techniques used to create different styles of engraved glass. This is also known as glass etching. Mirrors are typically engraved or etched the same as regular glass, since a mirror is simply glass with a special backing that makes it reflective. However, with some engraving techniques, such as using a laser, the front of a mirror would need to be engraved before the backing is applied. You can add an engraved glass accent mirror just about anywhere in your home. Mirrors help capture and distribute light. They also provide the illusion of more space. You can actually make a room look bigger by adding a mirror. Engraved mirrors create these same effects, plus they add another element because the engravings make them stand out as elegant home accents. A unique looking clock can be made from an engraved mirror. Many people like to display their favorite spiritual or inspirational messages on engraved mirrors. They are used as a kind of metaphor, reflecting one's thoughts or the words of God on a mirror. Wildlife and landscapes are popular designs for engraved mirrors. 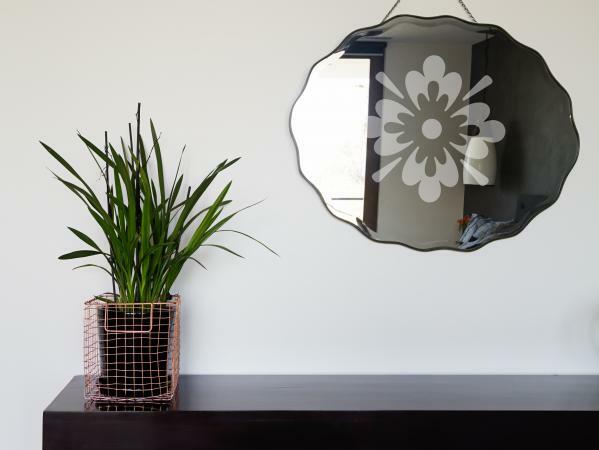 Many decorative accent mirrors are framed by engravings of floral, leaf or vine designs. Some engraved mirrors just have abstract designs on them. While most engraved mirrors might be hung as wall decor, there are other uses for engraved mirrors, such as placemats and table runners, mirrored centerpieces and etched mirror vanity trays. Mirrored glass doors on cabinets or closets can also be etched or engraved for a more classy, upscale appearance. First, you will prepare your stencil. Place the contact paper face down on an appropriate cutting surface. Tape your pattern face down on the contact paper and then turn it over. Carefully trace the outline of the pattern with the X-Acto knife and remove the cutout sections. Remove the pattern from the contact paper, which is now your stencil. Make sure the surface of your mirror is completely clean before you start. Remove the backing from the contact paper and place it on the part of the mirror where you want the etching to appear. Follow the directions on the bottle for the etching cream you're going to use. Pour some of the etching cream into a plastic bowl. Use the foam brush to generously apply the etching cream over the stencil and exposed parts of the mirror under the stencil. Leave the etching cream on for the specified time on the bottle. This is usually 10 to 15 minutes. The etching cream is actually a type of acid that is eating away at the glass surface to create the design. Make sure you are careful not to get the etching cream on your skin, near your eyes, or on any other surface as it will damage whatever it comes into contact with. When the time is up, take the mirror to a sink and thoroughly wash the etching cream off under running water. Give the mirror a final cleaning with glass cleaner and it is ready to display. Regardless of how the engraving is done, engraved glass accent mirrors are a great choice for adding a personal touch to your home decor.